Baseball officially kicks off tonight with the reigning World Series Champions, the Philadelphia Phillies, taking on the Atlanta Braves. Here's a pic of the grounds crew prepping the field for tonight's national audience when they tune in on ESPN2. It's gorgeous in Philadelphia today. Great baseball weather. Hopefully, by 8 p.m. the weather will still feel OK and not be too cool. I'll be here for you guys if you want to talk about the game while it's on. Just leave comments and I will comment back. Update: All the cool cats are here, by the way. I'm talking about the Tom Verduccis of the world and the fellas like that. And me. I'm here. I don't think that counts for anything, but I am here. Braves win! Derek Lowe goes 6 strong innings... bullpen shuts 'em down the rest of the way. Ha!! Yeah, good dream that would be Canuck. And for those of you that don't know, Sooz has the best seat in the house. Sooz you definitely count - your there representin the Baseball Card Blog Nation. Wish I could be there too. 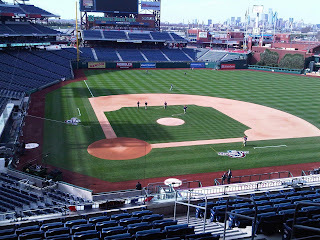 Phils WFC defense begins in 3 hours!! I'm conflicted. I have Derek Lowe on my fantasy team. But, I also have Rollins, Howard, and Lidge. Who to cheer for? it's the first inning relax over there. apparently Myers lost his fastball along with the 30 pounds he dropped this winter. way to go Rookie! Yeah KID! I don't like the gold trim on the Phils jerseys. Tell me that's just an opening day thing. I see what you're talking about, and it looks horrible. Suzy will investigate later. I have Rollins, Victorino and Myers on my fantasy team. EPIC FAIL! Thank God it's only the first day. I can't believe KC and CHW were 'snowed out'. Man I love that MLB The Show 09 commerical! Yes! Rollins got a hit! maybe the gold lettering is jinxing them. according to Sooz, fans have been filing out for the last inning or two. way to give up on the first day. 3 hours of torture for 5 minutes of excitement. yay. That's like your last date. Did I miss much of note watching WrestleMania instead of baseball?